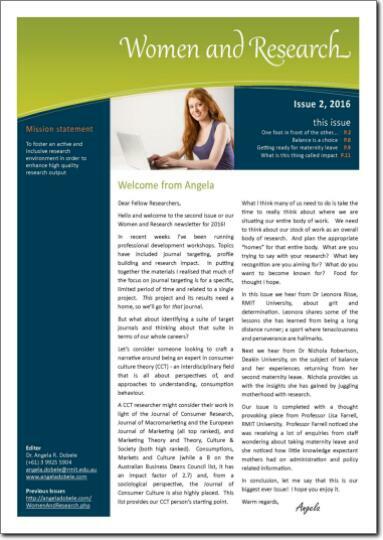 Associate Professor Angela R. Dobele introduced the Women and Research newsletter. The role of the Women and Research group is to foster an active and inclusive research environment in order to enhance high quality research output. 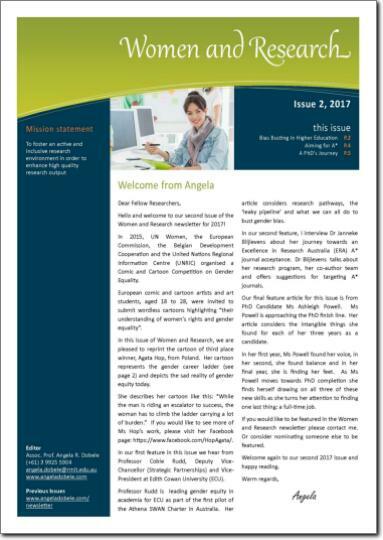 The newsletter highlights new research and new researchers, and showcases the efforts, contributions and tips of experienced researchers. 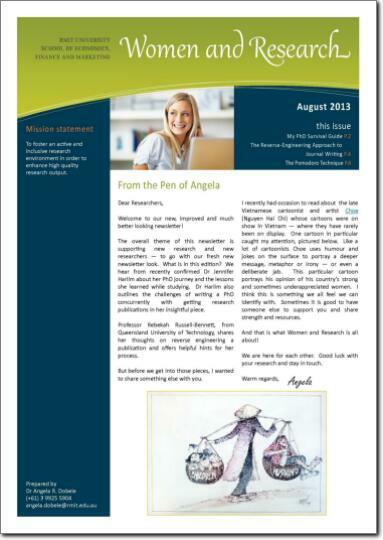 Contained on this page are a collection of Women and Research newsletters for your perusal. 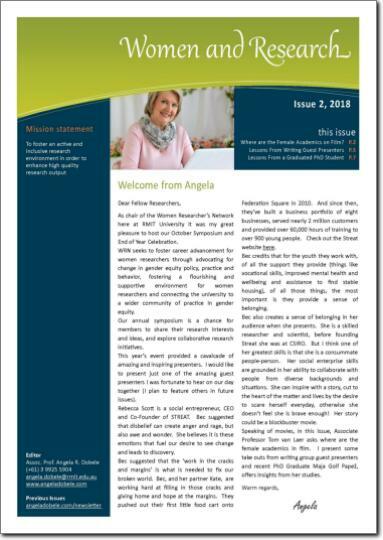 If you wish to subscribe to the Women and Research Newsletter, please use the Contact page to submit your details and ask me to add you to my mailing list. Welcome to the final issue for 2018. In this issue, Associate Professor Tom van Laer wonders where the female academics are from block buster movies. I present some take outs from hearing from a variety of writing group guest presenters and recently graduated Dr Maja Golf Papež offers insights from her studies. In this issue, we consider diversity, academic self-promotion and leadership. Madeleine Archer, Strategic Innovation Support Officer, talks about her experiences on a walk designed to challenge assumptions of identity and opportunity and which, quite literally, encourage us to walk the path of another. We showcase the Women’s Wall initiative (a brilliant idea by Professor Lisa Farrell) and the work of its facilitators, Dr Leonora Risse and Dr Lauren Gurrieri, in showcasing women's success stories. The final article this issue is brought to us by Professor Belinda Tynan, Deputy VC Education and Vice President at RMIT University, on her leadership lessons and her self-reflection journey. In this issue, we feature Professor Cobie Rudd, Deputy Vice-Chancellor (Strategic Partnerships) and Vice-President at Edith Cowan University (ECU). Professor Rudd is leading gender equity in academia for ECU as part of the first pilot of the Athena SWAN Charter in Australia. She talks with us about what we can all do to bust gender bias. In our second feature article, I interview Dr Janneke Blijlevens about her journey towards an Excellence in Research Australia (ERA) A* journal acceptance. Our final feature article is from Ms Ashleigh Powell, a final year PhD student, about the intangible things she has found on her candidature journey. Welcome to our first issue of 2017! In this issue, we hear from Mrs Udeni De S Perera about her transition from full-time PhD student to full-time academic career and part-time study. Harry Potter gets a nod and there are tips for women and research and self-promotion. Dr Tseen Khoo, co-creator of Research Whisperer, talks about why we should seek out the jobs beyond our work plan. Finally, Christchurch University’s Associate Professor Ekant Veer tells us about confirmation bias and the impact it has in the classroom. Our second issue for 2016 focusses on promotion/progression and career development. Dr Leonora Risse, RMIT University, provides some of the lessons she has learned from being a long distance runner; a sport where tenaciousness and perseverance are hallmarks. Dr Nichola Robertson, Deakin University, tells us about achieving balance after returning from maternity leave and Professor Lisa Farrell, RMIT University, talks about the policies and procedures related to maternity leave. I offer some food for thought about crafting a narrative for the whole of your research work, rather than thinking about it one project at a time, and what is meant by research impact. This issue focusses on confidence and conferences. Dr Swee Hoon Chuah, President of the Women and Research group, School of Economics, Finance and Marketing (RMIT), talks about a recent workshop event on the topic of confidence. Dr Chuah provides interesting information about overcoming barriers, the need to engage in behaviours that are advantageous to the workplace and how women can help themselves. We also hear from two PhD students, Tri Le and Tony Cooper on their experiences submitting to and attending their first academic conferences. 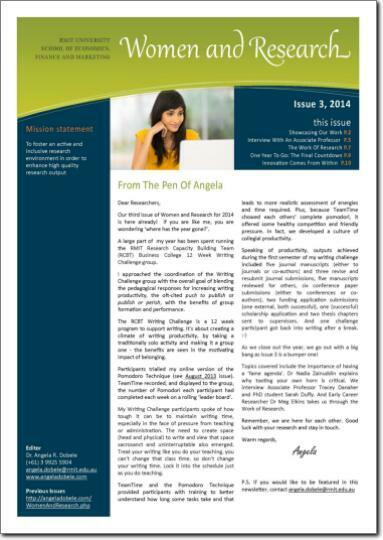 I talk about writing practices and wonder 'where do you do your best academic writing?'. 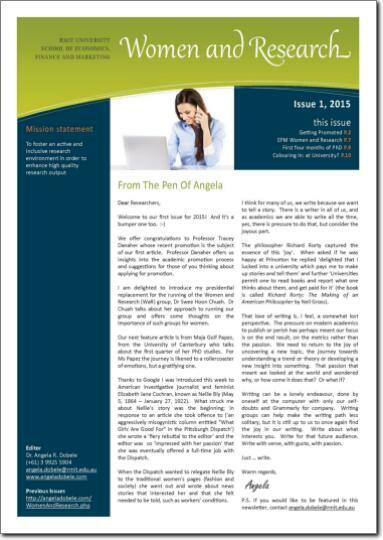 Welcome to the last issue for 2015. As we close out the academic year and gear up for conferences and Christmas I reflect on the lessons I've learned. We hear from Associate Professor Victoria Haskins on the Sisyphean trajectory of administration and service and from recent graduate Dr Carla Ferraro on the lessons she learned during her PhD. We interview Dr Tseen Khoo of Research Whisperer fame and we finish this issue with some thoughts on the dialogical conference model. It's a bumper issue and I hope you enjoy it! In this issue we hear from recently promoted Professor Tracey Danaher (Monash University) about her promotional to do list. I am delighted to introduce Dr Swee Hoon Chuah our new President of Women and Research, welcome Dr Chuah. In her article, Dr Chuah outlines her plans for our group and some thoughts on the importance of such groups. And we hear from Ms Maja Golf Papez (University of Canterbury) who is a brand new PhD student talking about the roller coaster it has been so far. I hope you enjoy our first issue of this year. It's another big issue as we close out the year. Dr Nadia Zainuddin tells us about the importance of showcasing our work. Associate Professor Tracey Danaher speaks with us about her career path and lessons learned. PhD student Sarah Duffy, in the final 12 months of her studies, tells us her plans and offers advice to newbies. Dr Meg Elkins speaks with us about the work of research. And finally, I close out this issue with some thoughts on being innovative, and a request to hear your stories on innovation for a 2015 issue. This issue we feature the academic journey of three different people and consider the messages and hints they can give us. Associate Professor Ekant Veer teaches us the importance of balance. Associate Professor Cathy Brigden talks us through her non-linear research path. And Associate Professor Sven Tuzovic highlights the things to think about when being an academic nomad. 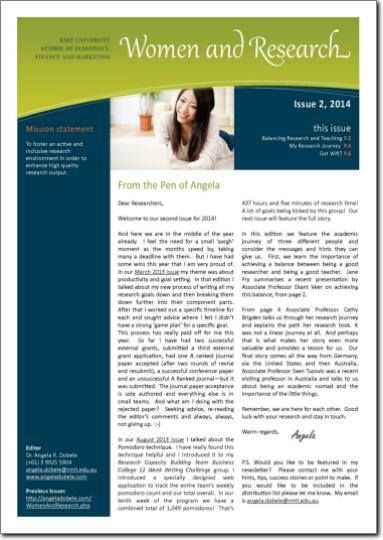 Welcome to our first edition for 2014! This edition is huge! This edition includes feature stories about successful research grant recipients in the School of Economics, Finance and Marketing, showcases the exciting work of an industry based research practitioner, offers a framing approach for categorising your research, highlights two visiting professors from 2013 and looks to the year ahead. 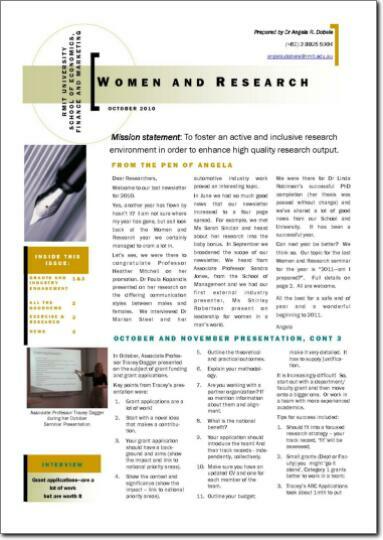 This newsletter saw the introduction of a new and improved style for women and research. The overall theme of this edition is supporting new research and new researchers. Guest writers and researchers included recently confirmed Dr Jennifer Harlim who wrote about her PhD journey, and Professor Rebekah Russell-Bennett, QUT, who shared her thoughts on reverse engineering a publication. 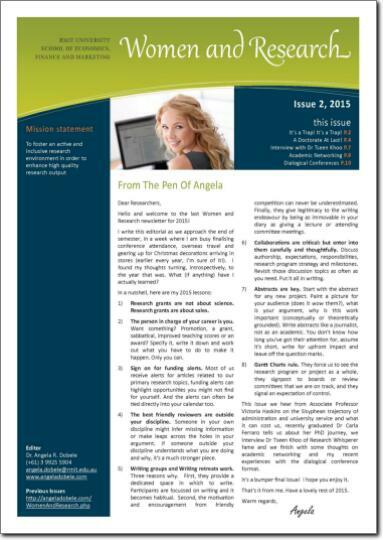 This newsletter's overall theme was research and more research. We covered the RMIT University Academic Expectations, ERA outputs and the academic peer review process. This edition's guest publishers were Associate Professor Ekant Veer, University of Canterbury, who discussed responding to reviewers and how to review, and Professor Sandra Jones, Director of the Centre for Business Education Research, who talked about the Centre and recent developments. This edition we talked about productivity and goal setting. Guest writers and researchers included my own work with Professor Sharyn Rundle-Thiele, Griffith University, and Professor Sandra Jones introduced the RMIT University Centre for Business Education Research. We also showcased some of the exciting developments other universities have introduced and took a brief look at the two tools for maximising writing effectiveness. 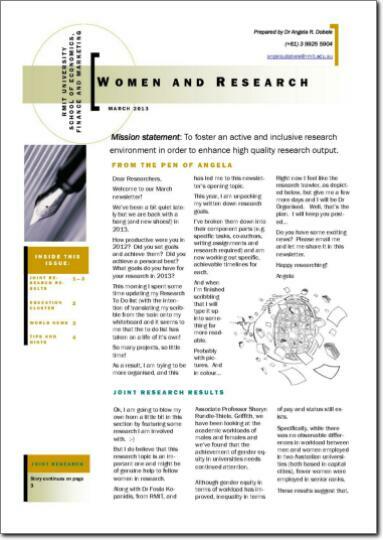 This final edition newsletter for 2010 highlighted the promotion of a female academic, Professor Heather Mitchell, and showcased the research work of Dr Foula Kopanidis and Ms Minh Phuong Doan, both from the School of Economics, Finance and Marketing. Women and Research guest speaker, Associate Professor Tracey Dagger, from Monash University, shared her grant application tips and suggestions. We also presented some interesting insights about the benefits of exercising to help make a more efficient researcher. This older edition introduced a guest presenter for our women and research network and introduced the exciting research work of PhD student Ms Sarah Sinclair. We also showcased a range of professional development workshops for academic women and a mentoring program offered in the United States. This edition showcased the work of Dr Foula Kopanidis in communication styles for males and females and her presentation to the women and research network. Dr Marion Steel was our feature academic and talked about her industry background and tips for writing and researching. 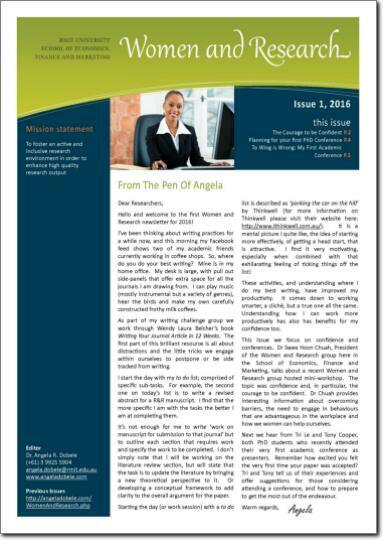 In this edition of the Women and Research newsletter we featured the career of Professor Heather Mitchell as she shared promotional insights, lesson learned in her career and tips for new researchers.